So, as always – your humble scribe is way behind in his scribbling and hence, with Felice Navidad - having come ‘N gone; NOT capable of escaping that diabolical NoFenderz Wormhole Vortex... As its now Cinco de Mayo, what better time to celebrate ‘Juan of Formula 1’s rising stars along with beginning my long overdue chronicling of the past year’s class de F1 Rookie Gran Primo Piloto’s; Ci? 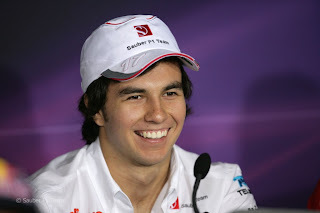 Sergio Perez Mendoza became Mexico’s first Grand Prix driver in 30-years upon taking the green flag at Albert Park in Australia on March 27, 2011 - after Hector Rebaque contested his final F1 season behind the wheel of the Brabham BT50-Cosworth as triple world champion Nelson Piquet’s teammate during the 1981 season. With Hector’s final outing being the season finale Viva Las Vegas Grand Prix held in the Caesars Palace parking lot. Like almost all typical Formula 1 drivers, Sergio began his racing career by competing in Go Karts, having begun at the tender age of six - and going on to set many firsts South of the Border, as Perez mimicked another F1 prodigy known as Master ‘Zebb, a.k.a. Sebastian Vettel... As Sergio not only won races as the youngest in class - finishing as runner-up in his debutant year of karting. But also took a number of Go Kart titles whilst being the youngest; champion in class, having won the Shifter 80cc crown in 2000; also contesting a few 125cc Shifter races. For 2005-06 Perez toiled with mid-pack German Formula BMW teams, gaining two podiums and finishing Top-10 series-wise in his sophomore season. And now Sergio is on everybody’s radar after his outstanding runner-up finish to Fredrico Suave (Fred Alonso( in Malaysia - where the young Mexicali was actually running faster then Alonso’s Ferrari and very well could have won the race except for a minor error of kerb hopping whilst just a scant half-second adrift of the two-time world champion Spaniard! Thus, will Sergio replace la Scuderia’s forlorn Felipe Massa? As Mexico’s GP2 Prince and Sauber F1 reserve driver Esteban Gutierrez waits in the wings for his turn in Formula One. Only time will tell, as perhaps Perez will become the youngest Mexican to win a Grand Prix in the near future, while he’ll be celebrating his birthday age in Barcelona - where he’ll make his 22nd Grand Prix start..